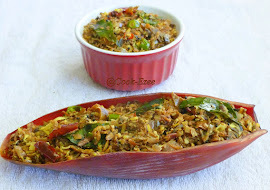 Ghee Rice or Neychoru as we call it, is a specialty rice in the Kannur/Malabar region. Neychoru is made by sauteing rice in ghee and aromatic whole spices and cooking them till soft. This is made richer by adding ghee fried cashews, raisins and garnishing with fried onions. Heat up a pan and pour the oil. When the oil is hot enough deep fry the onions till golden brown and set aside. Wash the rice and soak them in water for 20 minutes. Drain off the water fully and set aside. Meanwhile heat up a thick bottom vessel, add ghee and saute the cashews and raisins and take them out when they turn golden brown. 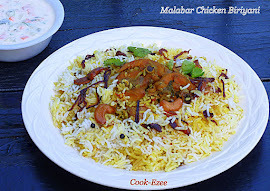 Add the rice to it and fry for two-three minutes so that rice absorbs the aroma of spices and ghee. Add the boiled hot water and salt to it. Stir till the bottom of the pan with a spatula or spoon and cover and let it boil. When the water and rice starts to boil reduce the heat to medium, cover and cook. Switch off the stove when the water is fully absorbed and rice is cooked to soft. Leave it uncovered for ten minutes and let it release the heat a little bit so that the rice grains do not break when you stir. Now stir the rice gently or move them to two or three platters so that the rice do not stick to each other. Garnish the Neychoru/ Ghee Rice with ghee fried cashews, raisins and fried onions. Serve warm with Raita and any Non-Veg/Veg curry of your choice. Enjoy!!! 1.What makes you laugh,smile or giggle? I do not need to hear any big jokes, to be frank I laugh on all the silly things happening around. Maybe any silly movie jokes, my kids pranks, my hubby mischief's, I even laugh when I slip and fall every year in the rock ice/snow even if my bump hurts terribly bad ;) ha ha ha..
2.What are your dreams for your future? I do not dream high and take life as it comes. I believe in the thought 'Man proposes God Disposes'. So why to regret by dreaming something and they fail? But of course will always pray to God to keep my family and all around the world in good health and mental peace. 3.If you are going to a cruise,where would it be and why? 4.How would you spend your vacation and with whom? Like most of the 'Pravasi'/Bird of Passage my vacation idea is always the India trip with my parent/in-laws and my whole big family. Eating In/Out, cooking less, eating a lot of ethnic/non-ethnic dishes cooked by anyone not me ;) and trying to reach out all the nostalgic places of my childhood. 5.If given a life,what life would you choose ? Your life now or your past? I do not believe in life as such past, present, future. Life is beautiful at times, sad sometimes, freaky, challenging and many more. I would not like to 'dwell in the past' but cherish all those good moments lived/still living as a sibling, daughter, wife, mother and friend. 6.Is there something that you wished before when you were young but you didn't get it? 7.Have you been in a situation where you might have given up but you still choose to move on? 8. Is there someone in your life who has been your source of strength and inspiration? My parents, siblings and husband is my strength and always have been supportive. Now let me pass it on to my fellow bloggers who have always inspired me with their great innovative recipes, wonderful pictures and inspiring comments on my posts :) So grab it friends feel proud for the award and pass it on to your favorite blogger friends..
Ghee Rice luks amazingly yumm Dear.Thanks for accepting this Award with me.Wish U many more in future. Flavourful and delicious nei choru :)..i love it !! Nice to read your answers..Thanx a lot for sharing it with me. :)..Merry Christmas!! Wishing your family a blessed Merry X'mas n Congrats on your awards,Keep rocking!! very flavorful ghee rice....loved the way u decorated the rice :-)n thanks for sharing the award with me :-)means a lot to me ! Nice to meet you Pratibha! :) Thanks for stopping by my blog. You've got a cool blog yourself. Love your photos. Following you back! 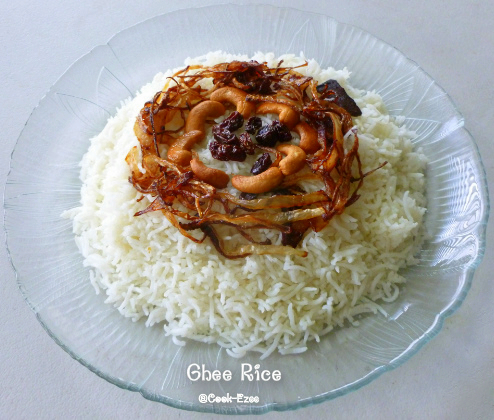 Ghee rice looks inviting and nice presentation. Thx for linking to the event. Thank You so much for considering me and passing me the award. I'll soon link this to my blog. Thanks again.